Betting against Chipotle now seems like a 'terrible' idea, Jim Cramer says. Shares of Chipotle (CMG - Get Report) are down 1% on Monday, but are rallying off the lows after a negative piece by Barron's over the weekend knocked the stock lower. For Chipotle, last week's earnings report didn't show a great quarter, but it was decent, said TheStreet's Jim Cramer, co-manager of the Action Alerts PLUS portfolio, on CNBC's "Stop Trading" segment. Barron's suggested the stock could fall by another 10%, but Cramer argued that a decline of that much seems unlikely at this point. The earnings report wasn't all positive, but it had a lot of positives, he said, and in five months things could be looking much better. Cramer explained that it usually takes 18 months for a stock to recover from foodborne-illness outbreaks. 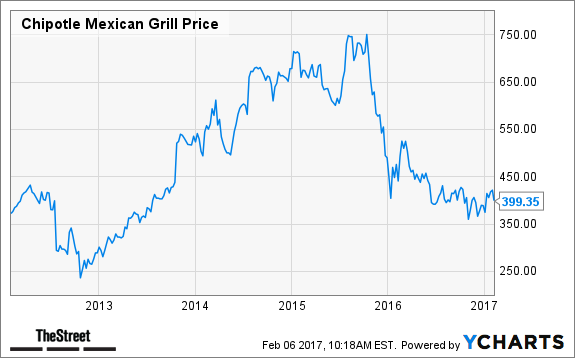 Given that Chipotle's last one was in December 2015, by early summer the burrito chain should be doing much better. Jack in the Box (JACK - Get Report) and Yum! Brands' (YUM - Get Report) Taco Bell had much worse outbreaks and they recovered just fine, Cramer pointed out. Shorting this stock is a "terrible" move, Cramer added. He concluded, "I would caution people that it's difficult to bet against a company that has an ethos that hasn't completely disappeared."